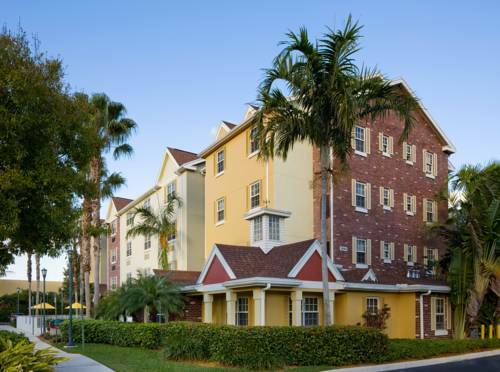 TownePlace Suites Miami Airport West / Doral offers spacious, all-suite accommodations near Miami International Airport. Enjoy Marriott's newest solution for extended-stay travelers which offers uncomplicated residential living with your budget in mind. Conveniently located near many corporate parks, Dolphin Mall and diverse dining choices in Doral, this hotel is an ideal choice. Our townhouse community provides spacious studios, and one and two-bedroom suites with fully-equipped kitchens, living area with sleeper sofa, large work spaces with 2 phone lines, personalized voicemail and on-site business services. The hotel features 24-hour staffing, daily housekeeping and on-site laundry services. Stay fit while traveling in the on-site fitness center or relax in the outdoor pool. This suite hotel in Miami is ideal for short or extended stays.